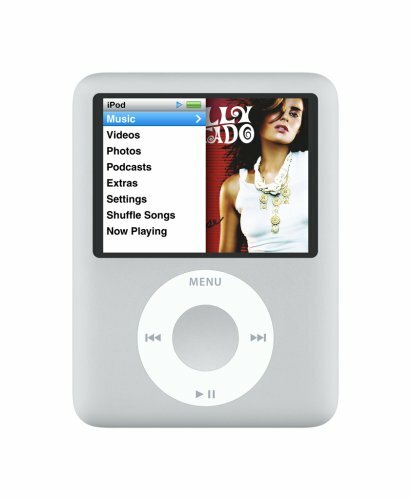 iPod nano is the small iPod with one very big idea: Video. Now the world’s most popular music player lets you enjoy TV shows, movies, video podcasts, and more.The larger, brighter display means amazing picture quality. It features an anodized aluminum top and polished stainless steel back. It’ll wow you for hours. Play up to 5 hours of video or up to 24 hours of audio on a single charge. iTunes provides music, movies, TV shows, games and more. All those features within a wafer-thin, 6.5-mm profile makes iPod nano a tiny big attraction you’ll just love carrying around! 2-inch (diagonal) liquid crystal display with blue-white LED backlight; 320-by-240-pixel resolution at 204 pixels per inch Compact and lightweight – Unit Size 4.1 x 2.4 x 0.41 inches (103.5 x 61.8 x 10.5 mm)/ Weighs 4.9 ounces Photo support – Syncs iPod-viewable photos in JPEG, BMP, GIF, TIFF, PSD (Mac only), and PNG formats Internal rechargeable battery delivers up to 24 hours audio or 5 hours video per charge / Recharges in about 3 hours (1.5-hour fast charge to 80% capacity) Includes Earphones, USB cable, dock adapter.